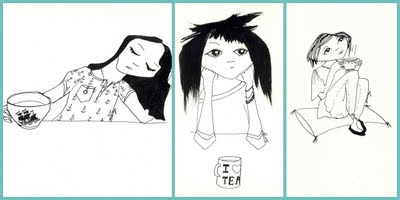 Guest Bloggers Wanted - This is Lilly, Lola and Pip; three lovely tea Ladies who need a little story written about them. You can make one a jedi loving crazy submarine sailor or a florist with deadly secateurs or even a trio of belly dancers who are on a mission to save global warming. The opportunities are endless and if you come up with a good short story I'll make sure there is a prize of your very own illustration for you.